“I had attended your Lecture and I wanted to attend your workshop”. “I missed your lecture at TMC & my friends told me that I must attend the workshop”. “I am a research student & I find it difficult to search with the time constraints involved”. “I am a practicing consultant and I see so many new types of cases in the OPD; I know I need to stay updated”. “We doctors have such mad schedules & I really don’t want irrelevant results when I search. So I am here”. These are some of the reasons that 12 participants – students, research/Phd students, consultants, who attended the PubMed workshop on 21st sep, at XIMR, Mumbai gave, for being there. We assured them that they were in the right place, barely realizing that this would be one of our most gratifying workshops! 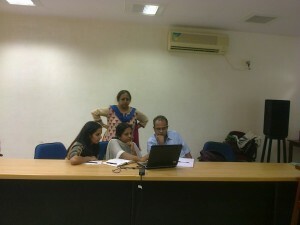 The initial exercise to know how they search and save results yielded the standard answers – Almost all the participants said they ‘type in a word, select the latest from the results, copy paste the results into a document and save it on the computer’. Understanding the concepts of searching and the features in PubMed went off well. They were all smiling and joking while doing the exercises on Mesh, and the Single Citation Matcher, and they turned out to be pretty good at it. One of the highlights of the workshop was when they were asked to select a topic of their choice and formulate a search strategy based on the principles of field and Boolean searches. All of them worked on it. But one student first searched using the strategies we taught and then went on to compare the results with his old method of doing a plain text word search, to see the difference. Of course the number of results varied significantly. When he shared this with the group everyone had a hearty laugh, realizing the difference in searching systematically v/s searching randomly. As we finished our workshop and walked down the stairs of XIMR there was this hugely gratifying feeling that comes with knowing that QMed has made a difference in the way the participants are going to approach literature search and that the workshop was a great success!